When it comes to 1-1 communications channels, WhatsApp has been setting the pace over the last few years. In this day and age of on-the-spot communication, you need to be where your customers are, and where they can reach out to you instantly. 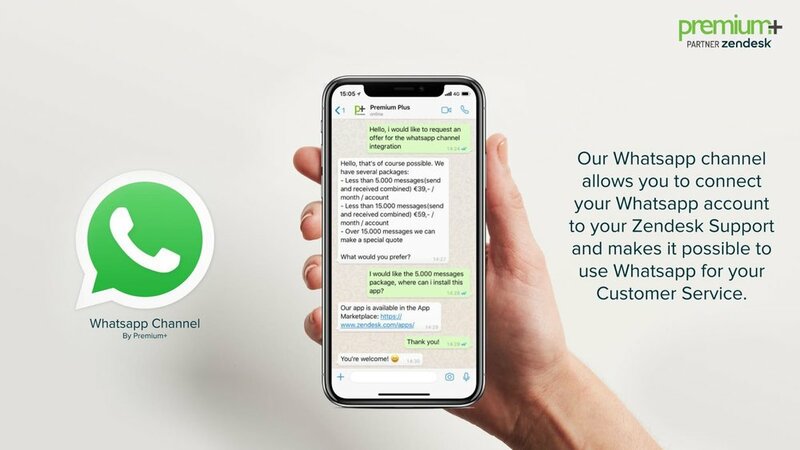 This WhatsApp integration allows you to add this ever increasingly popular channel to connect with your customers, right from where you already handle your support: Zendesk Support. Well, this WhatsApp channel allows you to easily connect your WhatsApp account to your Zendesk Support, making it possible to receive and reply to all the messages you're sent in your Zendesk. Any standard WhatsApp account can be connected, no need whatsoever to have WhatsApp for Business installed. Handle conversations exactly like you do with tickets from other channels: apply macros, set a ticket status, and assign to your agents, just like any other ticket. You know the drill. Moreover, this WhatsApp integration supports multimedia files. It allows you to receive pictures, video and PDF files. All you need to add an extra dimension to your customer experience and support. Add speed to your communication too: Instant Messaging is by far the most convenient way to quickly help out your customers with their issues. And for your customers it's likely the most accessible way to reach out to you. People are 70% more satisfied with customer support via instant messaging, in comparison to email or calls. Besides, this will allow your agents to interact with more customers at once, and deepen their 360° view on your customer content across channels. You install the channel as a private app in your Zendesk. We'll guide you through the installation process, which is very straightforward. A special quotation will be created.